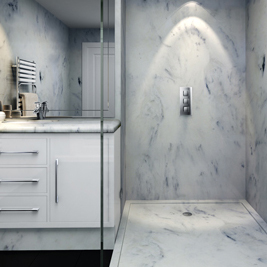 Luxurious granite, marble and sparkle surfaces for a professionally finished bathroom. Custom made shower trays – any shape and any size. Perfect for solving problems with odd sized showers and wetroom issues. 100% waterproof high quality stone resin shower panels made to order to specified shower and bathroom dimensions. Perfect match with a Versital shower tray. No grouting! 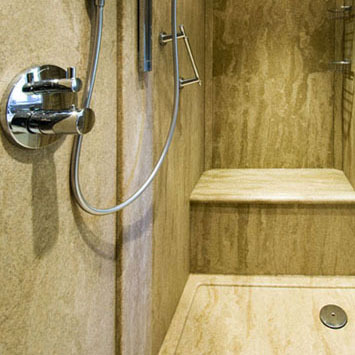 High quality stone resin shower trays. Available in the full range of granite, marble and sparkle colour options. Anti-slip base category 2. Custom made low profile rimless shower floors. Ideal for a sleeker appearance. Like our classic bespoke shower trays ideal for solving problem bathrooms. High quality bathroom vanity tops in a huge range of finishes, including marble, granite, stone and sparkle. Made to your preferred dimensions. High quality bathroom vanity tops with basins. Integral and ceramic basins available in the full Versital colour range. High quality stone resin bath decks and floor slabs. Available in the full range of granite, marble and sparkle colour options. 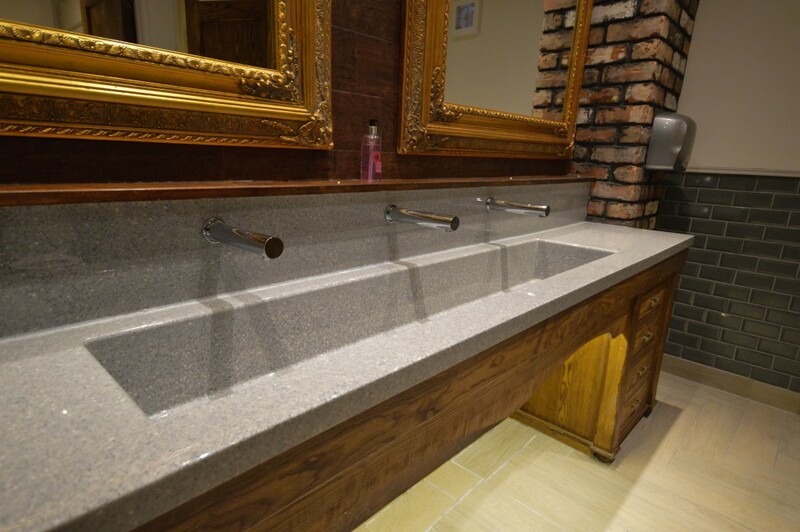 Hard wearing fully bespoke wash troughs ideal for high traffic washrooms – range of granite, marble & sparkle finishes. Manufactured to order. Finishing products for a truly professional bathroom installation. Skirting, dado & architrave to complement Versital’s product range. Made to order surfaces for public washrooms, bathrooms, bars, restaurants & bespoke installations. High quality made to order table tops in a range of marble, granite and sparkle finishes. Waterproof & stain resistant. Suitable for outdoor use. Waterproof & stain resistant made to order bar tops – large range of marble, granite & sparkle finish options. Easy to fit – no need for masonry equipment. High quality decorative panels for bar & restaurant areas. Granite, marble, translucent & sparkle finishes. Hard wearing & stain resistant. High quality marble and granite look vanity tops with integral or undermounted basins. Available with single or multiple basins for commercial installations. 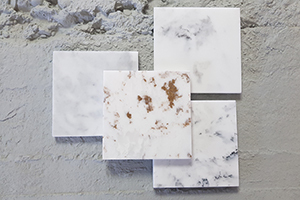 Hand made faux marble surfaces in a large range of colours to replicate the most popular natural marble finishes. Ideal for domestic & commercial use. Bespoke solutions for specific installation needs. Solid surface products manufactured to your design spec. Versital offer a range of natural looking marble and granite finishes, as well as a range of fabulous sparkle surfaces. Versital wash trough is fully bespoke and manufactured to order. The high gloss impervious gel top coat making it completely waterproof, hygienic and easy to clean. Ideal characteristics for commercial and public washrooms that have high traffic flow. Contact Versital direct on 01204 380780 for all commercial enquiries. As well as fully bespoke wash troughs Versital also offer Vanity tops and multiple bowl vanity tops. The ideal way to create an impact in the washroom, and protect surfaces in the most high traffic area. 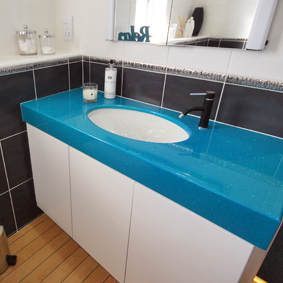 Versital washroom vanity tops are manufactured to specification, with integral or undermounted basins available. Full range of waterproof marble, granite and sparkle finishes available. For a personalised quote with trade costs please send through your enquiry and contact details, or call 01204 380780 if your enquiry is more urgent. 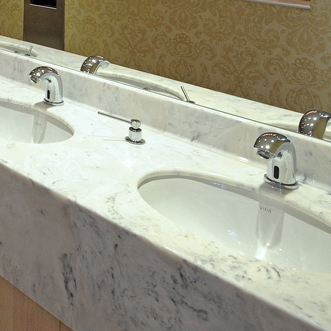 Luxurious granite, marble and sparkle surfaces for a professionally finished washroom. The protective gel coat also makes Versital bathroom surfaces exceptionally easy to clean, only requiring a gentle cleaner. The gel coat also has built in anti-bacterial properties making them ideal for high traffic washrooms. Versital has a range of 90 unique finishes and also offers the entire RAL and British Standard colour range for commercial projects. This makes it easy to stay true to any corporate image. 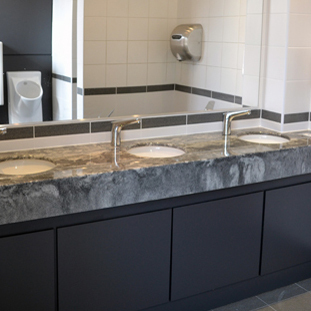 With Versital it is possible to have the marble or granite look for beautiful commercial washrooms without the problems the natural material brings. Versital does not suffer from staining and watermarks and is exceptionally hygienic and easy to clean. All Versital products are available in the entire colour palette to allow you to match your washroom surfaces throughout, from your splash panels, to your countertops. Versital deals direct with the trade, including architects, designers, specifiers, installers and sole traders. Please contact us direct with your specific needs or to set up an account. Versital is strong and can be scribed, cut, screwed into, and drilled on site, using normal wood working tools. Installation is straight forward needing no tools out of the ordinary. Have a look at frequently asked questions for hints and tips. Versital offers a range of bathroom surface products suitable for public washrooms and hospitality Bathrooms. 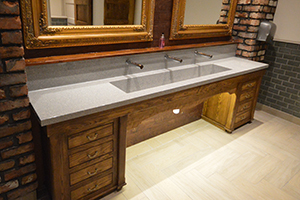 Made to spec vanity tops available with or without integral or undermounted basins. Find our more about Vanity tops. The most popular use of Versital surfaces, vanity tops with pre-installed basin’s ready to install made to spec. Alternatively you can also install your own preferred basins. Find out more about Multiple bowl countertops. Made to order panels up to 3 meters in length. Ideal to be used as shower panels, as splashbacks, or decoration in washrooms and hospitality bathrooms. Find out more about Versital Panels. As well as a range of standard high quality stone resin trays in 90 colour options, Versital also offers made to measure bespoke shower tray options. Ideal for wetrooms, large shower areas, odd shaped bathrooms and multiple shower area in changing areas. Find out more about made to measure shower trays. Finish installations with an easy to install and easy to keep skirting. Scuff and mark resistant with no need to refurbish. Completely waterproof so will not blow and does not need re-finishing or re-painting cutting down dramatically on maintenance costs. Find out more about skirting and architrave. Get a quote for any product FAST! View our “How To” & Past Projects Videos. Versital offer a range of natural looking marble and granite finishes, as well as a range of fabulous sparkle surfaces. 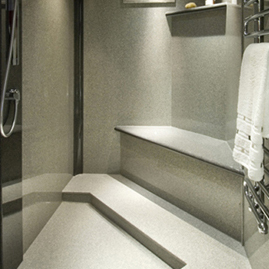 These surfaces are ideal for fabulous looking hard wearing bathroom installations. For a personalised trade quotation, colour samples or to speak to the technical team please get in touch. Versital solid surfaces are luxurious and opulent, keeping that 'good as new' look long after it has been fitted. Ideal for bathrooms, washrooms and commercial use. There are over 90 colours to choose from in granite, marble, stone and sparkle. We are certain that you will find a colour and finish that suits your taste and style.